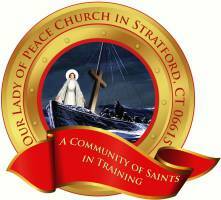 Our Lady of Peace Parish is a Roman Catholic Faith Community anchored by the belief in the real presence of Jesus Christ in the Eucharist. Our faith life is fed by the Word of God and strengthened by participation in the Sacraments of the Church. As a family of saints in training, we strive to be welcoming and attentive to the needs of others; sharing in the joys and the struggles of daily life. We hope to be the light and love of Christ, bringing His peace to all we encounter while sharing the Good News of the Gospel. Our Lady of Peace is ever our guide as we journey together toward the Kingdom of Heaven.